I’m sure we’ve all tried at least one fad diet before, it seems as if the latest trend are juice cleanses. Juice cleanses can range anywhere from a day to detox or up to a week, sometimes longer. The main issue with juice cleanses is that they lack necessary nutrients your body needs and do not consist of any protein or fat that are essential to keep your body going. “Cleanses purport benefits such as improvements with immune system function, fatigue and depression, weight loss, and an overall detoxification of your system. In reality, however, there is no scientific evidence in support that cleansing does any of these. In fact, such diets may not actually remove toxins from your body,” according to Fox News. 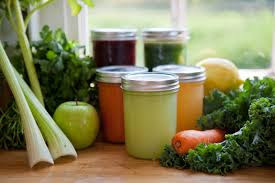 Regardless if you are doing a pure fruit juice cleanse or veggie cleanse, both have very similar affects on your body. “After two days, with each shot of juice, your insulin levels skyrocket, then crash. Your glycogen stores are pretty much gone, leaving your tank on empty-and you feeling weak and listless. Since you’re getting only about half the calories you need, your body draws on two long-term power sources: triglycerides, a type of energy stored in fat cells and protein, taken straight from your muscles. You begin to lose muscle mass, even if you’re still exercising every day,” according to Women’s Health Mag. Generally you do lose weight throughout the duration of a cleanse because of the dramatic reduction in your daily caloric intake. By the time you end your cleanse and begin to eat solid food, you have lost muscle. Once you begin eating normal, the calories you consume are likely to turn into fat since you have less muscle mass to burn the calories you are consuming, resulting in weight gain. Cleanses and detoxes can fall into the category of fad diets, which in the long run are not a feasible solution for a healthy lifestyle. Remember to eat everything in moderation and try to focus on having a balanced diet consisting of fruits, vegetables, protein and whole grains!